Roomy and modern one bedroom apartment on second story. Open and well lit living space. Kitchen well designed for cooking and dining! 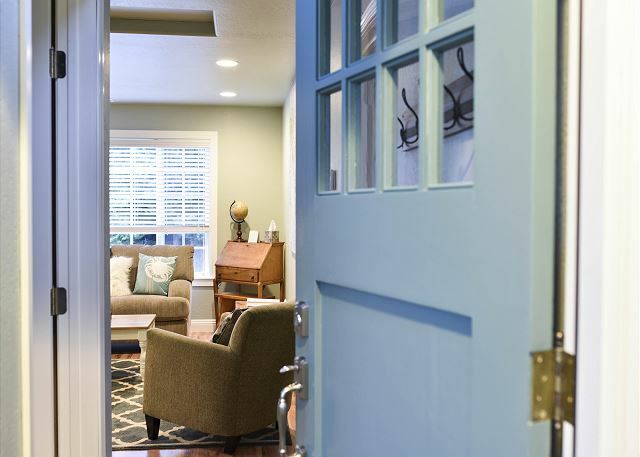 Recessed lighting adds softness to the already comfortable space. Smart TV cleverly hidden in wall cabinet with plenty of WIFI. Plenty of natural light to curl up with a good book. K-cup coffee maker-with K-cups included! Cupboards are well stocked for nice eat in evenings! Get a goods nights rest after a long day hiking or being at the office during your work trip. Shower/tub combo in a spacious and clean bath. Ground level entrance, then an easy walk to the second floor! Another door keeps the heat in! Entrance into the apartment at the top of the stairs. Small BBq provided for those that like to dine outdoors. Small yard with fruit trees. Area beaches short distances both north and south. This is Trinidad State Beach, about 10 minutes north. Azalea Haven - Brand New & Very Nice 1 Bedroom Retreat in Quiet Neighborhood. Please, absolutely no smokers. If you smoke or anyone in your party smokes, please do not rent this home. This delightful 2nd floor guest home has an inviting living room, king bed in the warm bedroom, full bathroom, and a very nice, spacious eat in kitchen. Quiet yard to relax in & BBQ. We also have a full fold up cushion set for another person to sleep in the living room area. 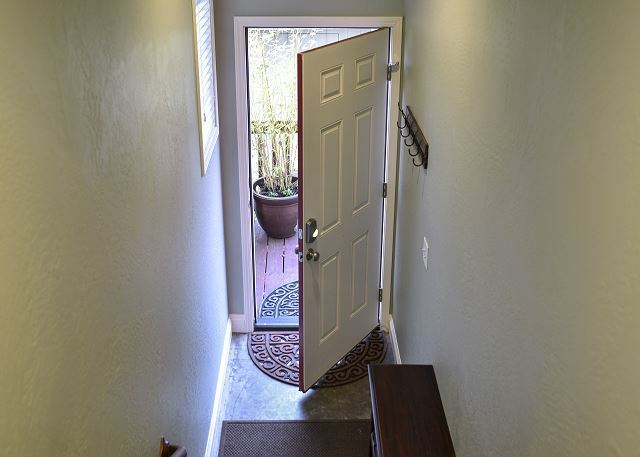 A great advantage of this property is that you are just 10 minutes to Arcata or 15 minutes to the beaches and Trinidad, and another 20 minutes to the Redwood National Park! 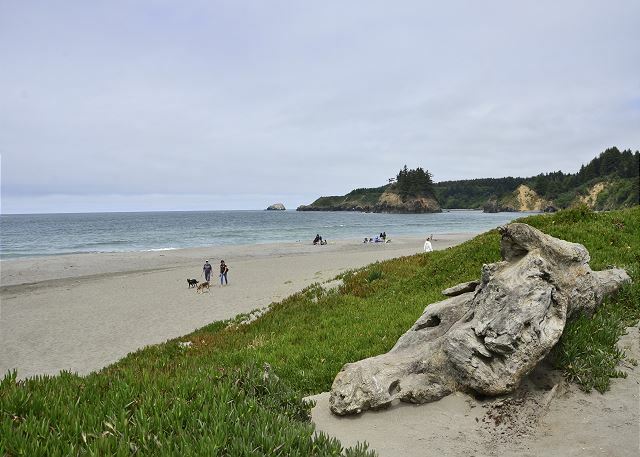 About 30 minute drive north to Redwood National Park @ Prairie Creek, 25 minutes to the Lagoon Parks (Big Lagoon, Dry Lagoon, Stone Lagoon, & Freshwater Lagoon all offer lots of outdoor things on the beach and water, including hiking for miles, kayaking & canoeing with rentals available, finding shells & exotic rocks, swimming, and just sitting on the beach), Lady Bird Johnson Trail, viewing the wild Roosevelt Elk, and much more! Horseback riding tours are available at Stone Lagoon as well, where they take you up into the Redwoods or on the beach - super fun for the whole family! Clam Beach is a huge beach with beautiful rolling dunes, miles of beach, and is literally a 10 minute drive. Fun for flying kites or even riding a bike on the packed sand, taking a long casual walk, or relaxing. 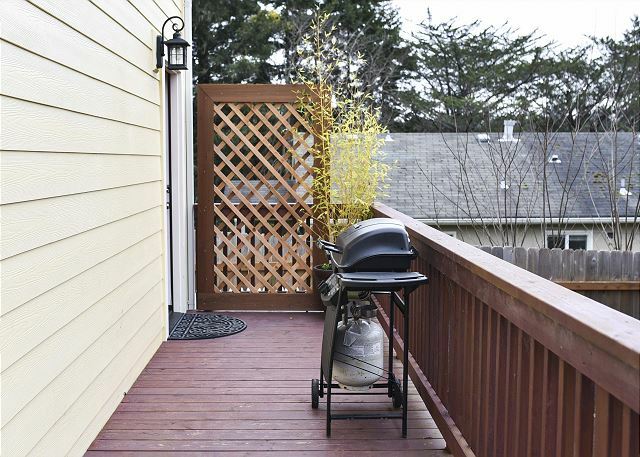 Geographic Close to Town, Near Beach, wooded, Close to Humboldt State Univ. Nice, new, quiet upstairs rental. Thank you for leaving a review of your stay at Azalea Haven! It is such a clean and cozy spot, with plenty of charm. We look forward to having you back again to the North Coast, this property is situated in a great location, close to shops and restaurants, and also just a short car ride to beautiful beaches and amazing trails. Look us up at Redwood Coast Vacation Rentals when planning your next trip to the North Coast! It was a nice, clean, very convenient place to stay. So happy to hear you enjoyed tour stay at Azalea Haven. Thank you for taking a moment to leave a review. It's a very comfortable property, clean and well cared for just minutes away from pristine beaches and gorgeous redwood trails. Please look us up at Redwood Coast Vacation Rentals when planning your next visit to the North Coast! Very cozy,clean and comfortable! Loved it and would highly recommend it for nice quiet stay! Thanks for leaving a review, we would love to have you back the next time your in the area, and please look us up at Redwood Coast Vacation Rentals when your visiting the North Coast in the future. Thanks again for taking a moment to leave a review! This is my third time staying at Azalea Haven, and I plan to return again. I relax as soon as I open the door. It is very welcoming and comfortable, and full of natural light. It is in a neighborhood, but close to town and the highway. Thank you for your review! Please come back and visit again soon, we look forward to your return! What a great apartment. They literally thought of everything. If you're going to be in the area, don't stay anywhere else. What a nice review, it certainly is a cozy and comfortable home, with everything you could want for a relaxing stay. Thanks for taking a moment to leave a review of Azalea Haven, we really appreciate your thoughts! Please look us up at Redwood Coast Vacation Rentals when planning your next stay on the North Coast and thanks again! Well worth the 15 hour drive! My wife and I stayed a week here just being tourist. This place has practically everything you could possibly need/want. One night while sitting on the porch, 1 deer came by to visit. The next night I heard a bunch of noise. Turned out to be 5 deer running by. I was pleasantly surprised since this house is in a neighborhood. Being a coffee drinker, I was happy to see not 1, not 2, but 3 coffee pots. Ha! It is close to everything. You are minutes from several beaches, the redwoods, stores, gas stations and even a quaint little zoo. Met the owner briefly. Very nice guy! The place is small yet very roomy. Decorated with the perfect accents and not overly showy. I would recommend this home in a heartbeat! I was very impressed and felt right at home. Thanks for the great review! I have nothing to add, you have described perfectly. Thank you for choosing Redwood coast Vacation Rentals. Our stay was excellent, the space was spotless and has a comfortable bed. Highly recommended! Thanks! We aim hihg for customer comfort. Thank you for choosing Redwood Coast Vacation Rentals with over 100+ vacation homes available! Thanks! It's a great spot! Thank you for choosing Redwood Coast Vacation Rentals! When we arrived we found this rental to be perfect for our needs. Everything we could have needed was there. the neighborhood is charmingand the place is very quiet and private. the property managers were so thoughtful and kind. They even mailed me an item I had left behind. We would be delighted to stay here again. Thanks. Lynn! Hope we can have you again at the Azalea Haven and thank you for choosing Redwood Coast Vacation Rentals! This property was absolutely adorable. It was clean with updated furnishings. We felt at home immediately. The king size bed was SO comfortable. They had quality bedding & linens & lots of pillows to choose from. We also appreciated the well equipped kitchen. This property is in a quiet neighborhood & the instructions on how to get here were spot on. We were a bit concerned because we were arriving late at night & previous reviews had stated finding the property was an issue. That was not the case at all. We loved the location. We were only a few minutes from most amenities (gas station, grocery store, restaurants). Our only request would be that the tv have local channels available. Overall, this was an amazing stay & we loved this property. Sometime the GPS will lead you astray, depending on the system you are using. But the written directions are spot on. Glad you had a wonderful stay! Azalea Haven - Lives Up to its Name! My husband and I came for a short trip to visit our son, who is new to the area. The Haven is such a nice place; it has everything one would need. The kitchen is well appointed, the bed is very comfortable, it was very clean overall. We were really happy with our stay. Thanks! We love having fabulous guests such as yourselves and thank you for choosing Redwood Coast Vacation Rentals! Thank for a quite, clean and very beautiful place to stsy on our trip for our son’s graduation. We are happy to have you with us. Thank you for choosing Redwood Coast Vacation Rentals! Had lovely two night stay at clean and quiet upstairs unit above garages. On gravel road (initially hard to find, since Google maps put us many blocks away) - would be hard to find the first time in the dark or on very rainy day. Nicely decorated, comfortable, excellent bed. Thanks, Deborah! I'm not sure why GPS led you astray. We do have written instructions that are emailed to everyone. Thank you for choosing Redwood Coast Vacation Rentals! Beautifully decorated and clean. 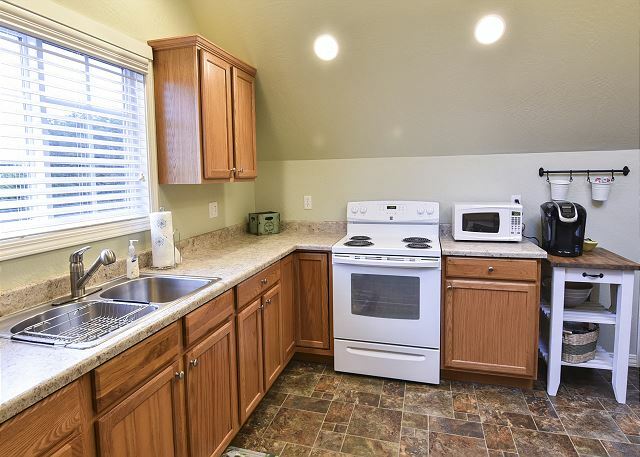 Spacious kitchen with all the amenities. Exceeded expectations. Thanks, Carol! So glad we could host your for Thanksgiving and hope we can see you again in the future! My daughter and I stayed at Azalea Haven 3 nights. We were so surprised when we entered the place at how beautifully decorated it was. It was fully stocked with everything you could think of. The furnishings (especially the bed) were so comfortable. It was very quiet and relaxing. Thank you so much for allowing us to rent your place we will definitely recommend your place to others. Thank for the awesome review! Hope we get to see you again! We rented Azalea Haven with our 1.5 year old toddler. It was impeccably clean, comfortable, and well stocked. We will absolutely rent again whenever we're in town to see family. The rooms were all spacious, furniture and bed were also really comfortable. The keyless entry and provided electronics/wi-fi were a huge plus for us as well. Thank you for the great review! We hope we can host again in the future with Redwood coast Vacation Rentals! I stayed at the Azalea Haven in McKinleyville CA, and Redwood Coast Vacation Rentals Co. was fantastic. The private residence was secure, spotlessly clean, and very well-appointed. It was one of our favorite places we have stayed. It was full of amenities, and nothing was forgotten or left out or didn't work. Everyone we worked with at Redwood Coast communicated quickly, and they were all very helpful. Thank you for providing such a hospitable respite! Gosh I'm blushing at such a great review! Hope we can host again in the future! Thank you for choosing Redwood Coast Vacation Rentals! Very convenient to coast, Highway 101, and town amenities. Extremely clean and well taken care of. You can tell the owners take pride in providing a positive experience for your stay. Calm and comfortable feeling as soon as you walk in the door! Supplied with every possible thing you could need. Open areas with large windows. Bathroom was very clean. Bedroom was large with king size bed and low lighting. Living area has fireplace and couches with TV and plenty of room for hanging out. Kitchen is open with oven, fridge, sink, coffee makers and plenty of other things to make it feel at home. When we arrived the owner was arriving on his property, which is not too close to the rental property, and was very polite and spoke to us breifly without being overbearing. Lovely place!!! This was a great home away from home. Centrally located off Hwy101, the artery of the Redwood forest. The property was spotlessly clean and had every amenity we needed. We came to see the redwoods forests. Took over 800 photos and could have taken 8000. Best vacation we've had in a while. We miss it already. Thanks for this awesome review! We hope we can host again with Redwood Coast Vacation Rentals! We stayed two nights at the Azalea Haven property and were very pleased. It is conveniently located near Arcata. Peaceful and nicely decorated too. The bed was very comfortable and the kitchen had everything we needed. So pleased you had a nice stay. Hope we can host again with Redwood Coast Vacation Rentals here at the Azalea Haven or any of our 100+ vacation homes! Felt like home the moment we walked in. Beautifully decorated. Very clean. Fully stocked with everything you could want/need. Great bargain compared to a hotel or other option. Owners were very friendly. Thanks for the great review and happy you loved your accommodations! Azalea Haven is a gem! I grew up in Arcata and now travel to McKinleyville from the Bay Area to visit family and have been disappointed that the hotel options are so terrible. So we gave this rental a try and we were simply amazed. Extremely clean, fresh, new and quiet while still being close to town. We give it 2 thumbs up! We hope your two thumbs up brings you back to this location again! Thanks for the great review and see you in the future! A LITTLE "PEACE" OF HEAVEN! Enjoyed a wonderful 3 day anniversary retreat in a very quiet neighborhood at a very reasonable price! 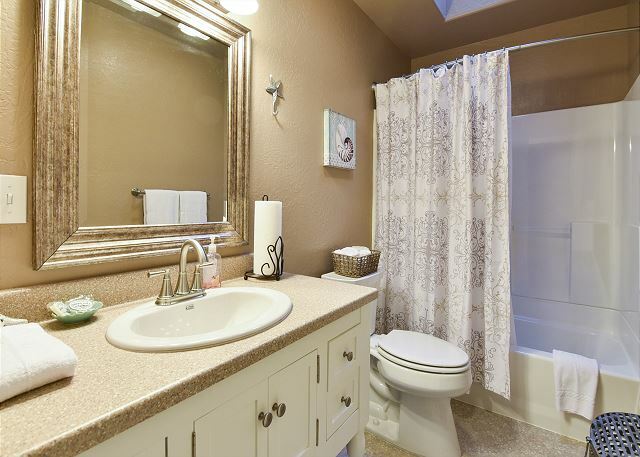 Very clean, nicely equipped with a pleasant décor and homey feeling. Great central location for roaming up and down the coastline! We will be back! Thanks for the great review! Azalea have is a nice spot for exactly as you described! We have over 100 vacation homes to choose from here at Redwood Coast vacation Rentals! Something for everyone! Thanks for the great review and we are happy to please! Please come again! We loved our stay at Azalea Haven. The facility was tastefully decorated and well stocked with anything we needed. It was close to places we wanted to visit and a wonderful retreat upon completing the day. Highly recommend a visit here. It is a very nice place to stay. The owner has take care to make sure every guest if comfortable and all needs are met. We hope you can come and visit our area again! My daughter & I stayed at Azalea Haven in Sept. while visiting Redwood parks. It easy access to the parks & restaurants. The apartment was modern & clean. The only problem we had was understanding how to unlock the door. Thanks for having a nice stay and enjoying Azalea Haven! Glad I was able to seeing by and show you how to use the door lock! We hope you can visit us again at this great spot! 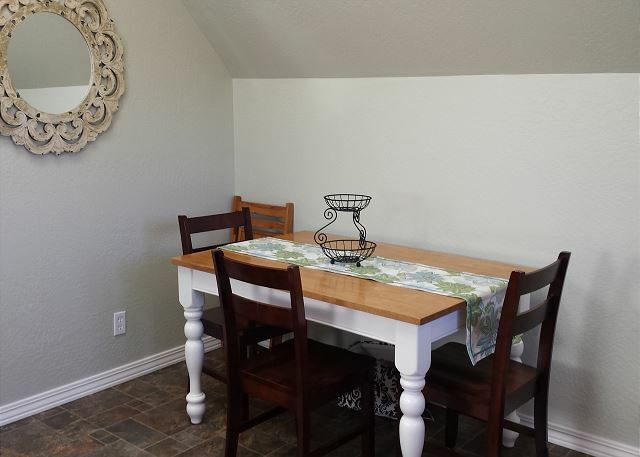 we loved this vacation rental was in a quiet area it has great décor very well taken care of great kitchen large rooms the bed was very comfortable would recommend this vacation rental to my family and friends hope to go back again. This is a great spot! Hope you will choose Redwood Coast Vacation Rentals on your next trip to the North Coast! As soon as I walked through the door I felt at home. It is filled with light due to all the windows, skylights and solar tube. The colors are soothing. The furnishings are very comfortable. I would definitely stay here again and have already recommended it to family and friends. A very pleasant stay. Thanks and hope you can stay with us again and we appreciate you choosing Redwood Coast Vacation Rentals! This was amazing vacation rental. The house was very clean as well as spacious. 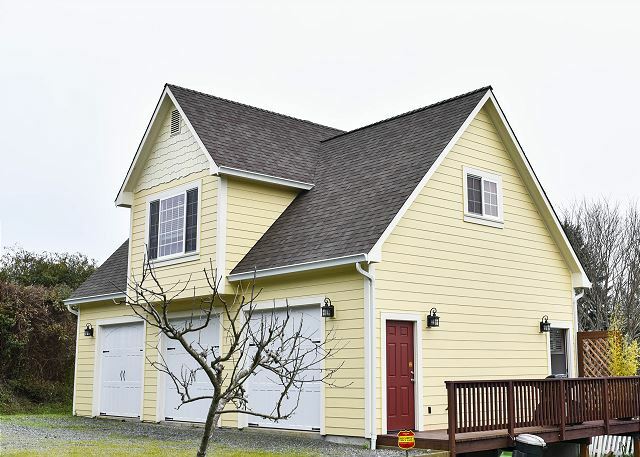 I highly recommend this to anyone seeking a beautiful & quite vacation home in Humboldt County. Thanks! It really is a good spot with Modern amenities with a soft and luxurious feel. We hope you come again and choose Redwood Coast Vacation Rentals! ! Thanks you! Thank you for choosing Redwood Coast Vacation Rentals! Great stereo that provided evening entrainment and the ability to play movies from the local redbox. Thanks Robert! So glad you liked our Azalea Haven. The owners took great care in the ambiance and amenities. Glad you noticed and hope to se you again! Beautiful, spacious apartment. It is above the garage but we did not hear any noise for our stay. It is really nicely decorated very comfortable king bed, soft linens and towels and all the kitchen utensils you could need. Wonderful retreat. Would definitely stay again. Another great review! 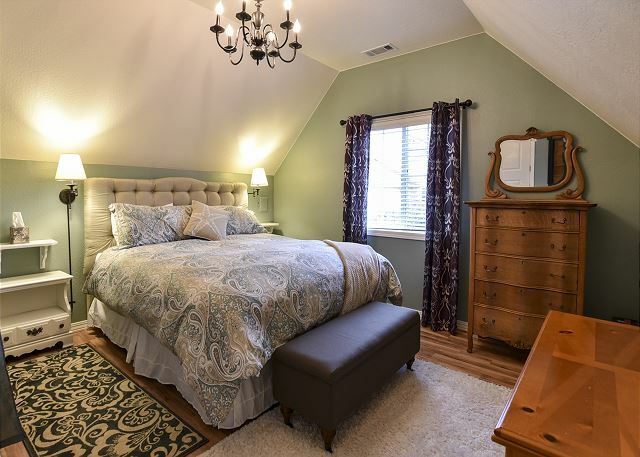 Azalea Haven is a great place for a single or couple to spend the weekend, or a whole week! Please call reservations now to book with Redwood Coast Vacation Rentals! 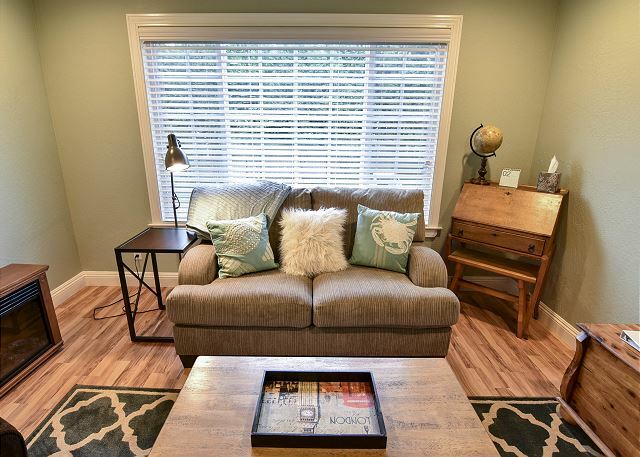 Beautifully and comfortably decorated rental with just the right amenities. I'd definitely stay here again, but hope they upgrade their sheets so they are not scratchy. Other wise perfect! It is an above detached garage apartment so there are stairs to climb if that is an issue for a person. You were one of the first to stay at the Azalea Haven, I am glad that you found it well decorated and comfortable. Thank you for the mention of the sheets, we appreciate the feedback and will address it right away. Thank you for booking with us and I hope you will get a chance to visit us again. I had a peaceful stay here. It is a spacious 1 bedroom apartment with a well-stocked kitchen. The apartment is decorated very nicely with thoughtful attentions to details such as cozy sofa blankets, chair-side tables, etc. And, as a bonus, the property management team would drop by with cookies, coffee pods, and other treats. I am happy that your stay was peaceful at Azalea Haven. I agree with you that the home is well stocked, cozy and comfortable. We are glad that you liked the treats!..Come back and visit us soon!! !